International students can now learn basic Dutch online to smooth their transition to the Netherlands - even before they arrive in the country! As part of a drive to bind more international students to the Dutch economy, the “Hoi Holland!” app was recently launched, allowing students to learn the basics of the Dutch language quickly and easy. According to Nuffic, the agency promoting Dutch education abroad, Holland hosted 90 500 international students in the 2012-2013 academic year. However, a report by the Social and Economic Council of the Netherlands (SER) drew attention to the fact that while 70% of international students would like to remain in the Netherlands following graduation, only 27% actually do. The report led to the minister of Education, Culture and Science, Jet Bussemaker, launching a programme called Make it in the Netherlands in 2014 aimed at making it more attractive for top international talent to start a career in the Netherlands – especially in priority sectors. The strategic recruitment plan serves not only to strengthen the international knowledge economy of the Netherlands, but also to raise the quality of education and success rate of both Dutch and international students and improve the study experience of international students. One of the lines of action proposed in the plan to maximize international students’ chances in the job market is ensure they have a basic, but good grasp of Dutch. “English is often not sufficient to find a job in the Netherlands, particularly in the small and medium enterprise (SME) sector. An early introduction to the Dutch language can ease the path of international students as they find their way in Dutch society and enter the Dutch job market,” the report reads. Hence this month the launch of the Hoi Holland! 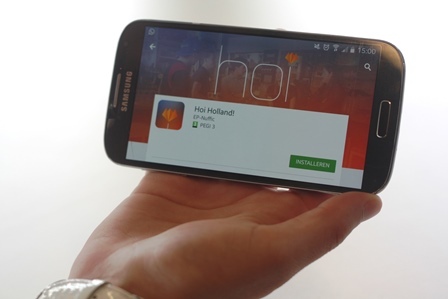 app – which translates to “Hi Holland” in English. The app is a so-called serious game that uses realistic situations to teach students words and phrases they can use in very practical interactions, such as getting a train ticket in Schiphol, asking for directions while travelling, or simply ordering a cup of coffee. Dutch culture is also thrown into the app, with words relating to bicycling in the cities and ordering sides such as bitterballen with you drink, or borrel, being taught. Nuffic pointed out on its website that “although you can speak English with practically anyone in Holland, learning Dutch helps you to get to know the country, its culture and society”. The agency also provides useful links to other opportunities for learning Dutch before or after arriving in Holland.